We spent weeks examining rolling laptop bags, and here are all of the top options designed for women — generally with the look and style of a purse, but big enough to carry a laptop, and with the lovely extra design feature that they can roll on wheels. These are solidly built pieces that hit a sweet spot between a large daily purse and small overnight luggage. There are also plenty of not-specifically-for-women options that we cover in our article on the best rolling laptop bags. 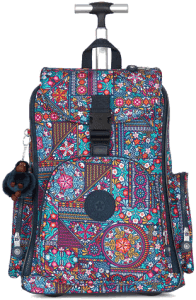 Plus, we’ve got you covered if you’re looking for a rolling carry-on backpack option (that is, a carry-on bag with backpack straps and wheels). And if you want to go even bigger, there are great full-size rolling backpacks as checked luggage that you could consider. Among the options that are designed as rolling women’s purses below, we think that Samsonite and Kensington are the most reliable brands; they are more often backed by consumer testing organizations and offer solid warranties and generally positive real customer reviews. But do check all of the options below as there are a variety of different compelling features — and in the end the choice also greatly depends on your style. Originally published: April 4, 2018. Updated July 22, 2018: removed the no-longer-available AmeriLeather Deluxe Skylar Women’s Large Rolling Laptop Tote. This is part of the more affordable line from Kenneth Cole, and its style screams business. The front compartment includes two open top pockets and a removable accessory pouch. Then there are padded tablet and laptop pockets. The final section is meant more for clothing, with compression straps. The bag measures 13.5 x 16 x 7.5 inches (34.3 x 40.6 x 19 cm). It’s available in two colors, black and charcoal, from Amazon, eBags and Zappos. 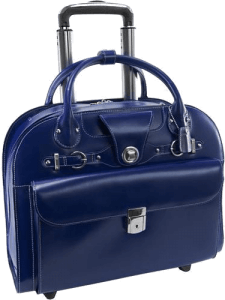 This bag is designed to fit up to 16″ laptops and measures 14 x 17 x 9 inches (35.6 x 43.2 x 22.9 cm). It’s available in black, charcoal and red from Amazon. This bag is made for comfort — both for you and for your laptop. There is ample padding and an Air-Flo Contour designed to redistribute heat and provide for smooth carrying. Even the pull handle is ergonomically designed to reduce stress on your pulling arm. The bag measures 15.5 x 7.9 x 18 inches (39.4 x 20.1 x 45.7 cm) and can be found on Amazon and eBags. There is an impressive lifetime warranty. A lovely looking bag, but a bit overpriced. It can fit 15″ laptops. It has a hide-away padded backpack straps, but when you get tired of carrying it on your back, there is a retractable multistage wheel handle. It’s water resistant and comes with a furry monkey key fob. Apart from the printed design, it also comes in solid black and navy. It measures 16.25 x 18 x 8.5 inches (41.3 x 45.7 x 21.6 cm) and is also available from Amazon, eBags and Zappos. 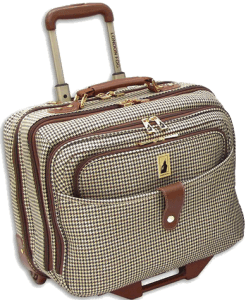 This classy piece is made of woven houndstooth material. It fits most airline overhead compartments at 14 x 17 x 8.5 inches (35.6 x 43.2 x 21.6 cm) and is available from Amazon and eBags. This is a very stylish bag for laptops up to 15.4”. It has a quick access front pocket that can be secured with a lock. There’s an interior organizer with storage space for smaller electronics, business cards, a key holder, and pens. The zippered main compartments can also be locked. The leather bag is available in black, navy, red, and brown. There’s a strap for attaching to other, larger rolling luggage. For some uses it may be a bit small at 17 x 6 x 13.5 inches (43.2 x 15.2 x 34.3 cm). You can find it on Amazon and eBags. This rolling purse offers younger, more vibrant looks with 20 different prints to choose from, including different interiors for each as well. The laptop compartment holds up to 15″ notebooks. The piece measures 16 x 18 x 9 inches (40.6 x 45.7 x 22.9 cm) and is available from Amazon and eBags. 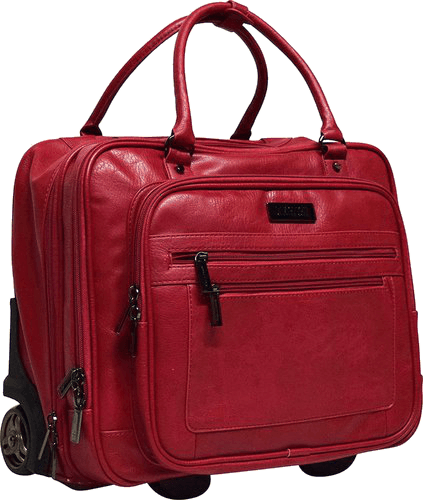 This wheeled women’s business travel bag has a padded laptop compartment for up to 15” laptops. There are front and side organizational pockets. It’s well-built and comes with a two-year warranty . It measures 8.25 x 17 x 14 inches (21 x 43.2 x 35.6 cm) and can be found from Amazon and eBags. 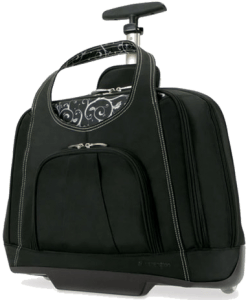 This vinyl rolling purse-like business laptop bag comes only in black and can fit up to 15.6″ laptops. There is a three-year warranty. It measures 16.5 x 12.75 x 6 inches (41.9 x 32.4 x 15.2 cm). Check prices for this bag on Samsonite, Amazon and eBags. 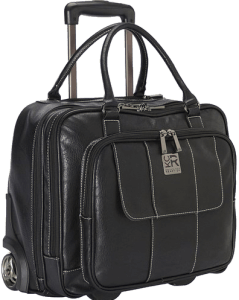 This is similar to the previous Samsonite offering, but with spinner wheels and is more designed for travel. We think spinner wheels are far from a necessity, especially for such a small carry-on, but recognize that some people do like them. The padded compartment accommodates up to a 15.6″ laptop. The bag measures 16.5 x 13.5 x 8 inches (41.9 x 34.3 x 20.3 cm) and is available from Samsonite, Amazon and eBags. This wheeled women’s laptop bag is made of embossed crocco leather. The wheeled base is detachable, making it ideal for both daily office use as well as for rolling along on an overnight trip when you’re carrying a bit more gear or clothes. There is an included rain cover and shoulder strap. The main compartment’s padded laptop sleeve fits up to 16” laptops. The overall piece measures 18 x 8.75 x 14.5 inches (45.7 x 22.2 x 36.8 cm) and can be found on Amazon and eBags.